Apparently £1399 is the RRP. Not sure if anyone pays that, but under £1K seems like a good price. Reduced to £1049 and another £50 off with the code. 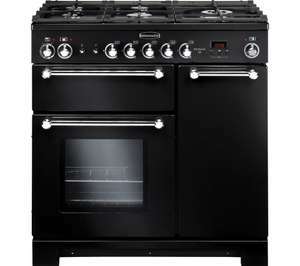 I've had a Rangemaster similar to this for the last few years and it's fantastic - transformed my cooking! This seems a very good price. I've had a Rangemaster similar to this for the last few years and it's …I've had a Rangemaster similar to this for the last few years and it's fantastic - transformed my cooking! This seems a very good price. I don't mean to sound rude but how is it any different from other cookers? of all the cookers we have had, griddle is great for steaks, second oven to keeps things warm, think of xmas. The double oven is a Godsend at Christmas and as soon as I started baking with my new oven the cakes rose better than with my old cooker. The build quality is excellent and it is very well designed. Mine has a glass lid that covers the gas hob when not in use which creates more usable surface area too. I wouldn't consider another make now - not that I should need to buy another for a long time - I hope. Great cooker but have to say on ours the grill is rubbish. It’s either far too hot or far too low can’t get a decent mid point. Agree with the grill comment. But at sub 1000 great value. Don't know anyone who has bought one and regretted it. Picked this up when it was last on offer. At least than £1000 I'd say its definitely worth it. The Gas Hobs are great and solidly built/easy to clean. The only downside I've had so far is its taking ages to "burn-in". I still get that smell from the ovens despite have run the ovens at full temp 5 - 6 times. Might have to chase it up later. They are very heavy and awkwardly shaped. Rangemaster will leave it on the pavement if they can't get it in your home. Picked this up when it was last on offer. At least than £1000 I'd say its …Picked this up when it was last on offer. At least than £1000 I'd say its definitely worth it. The Gas Hobs are great and solidly built/easy to clean. The only downside I've had so far is its taking ages to "burn-in". I still get that smell from the ovens despite have run the ovens at full temp 5 - 6 times. Might have to chase it up later. Thanks for the tip, I will try this ASAP!